on monday, i noticed a lot of posts for the #nodfamilyhome in my instagram feed and was immediately intrigued. i am a big, big land of nod fan and was determined to get inside this beautiful space. i emailed the PR team on tuesday evening and they said to come on by wednesday morning before they closed up shop. the nod team took over an entire chelsea townhouse and decked it out top to bottom in land of nod goods (with some crate & barrel and cb2 thrown in). it was AMAZING. walking up to the townhouse, i was immediately charmed. and then i went in to the first room and was BLOWN AWAY. 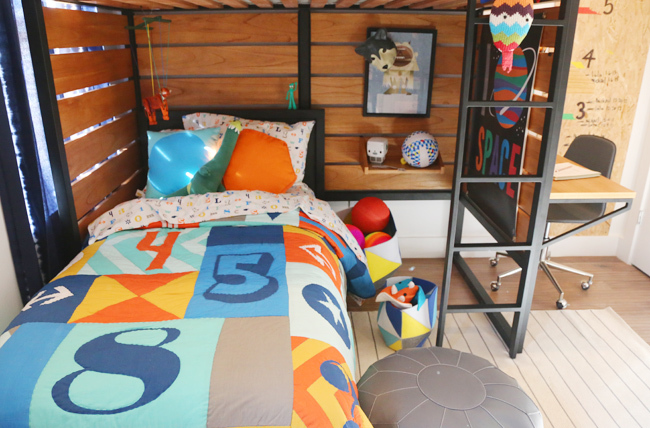 i truly love almost every single thing that land of nod does, but this show house was EPIC. like one of their amazing catalogs come to life. so much attention to detail. it was incredible. 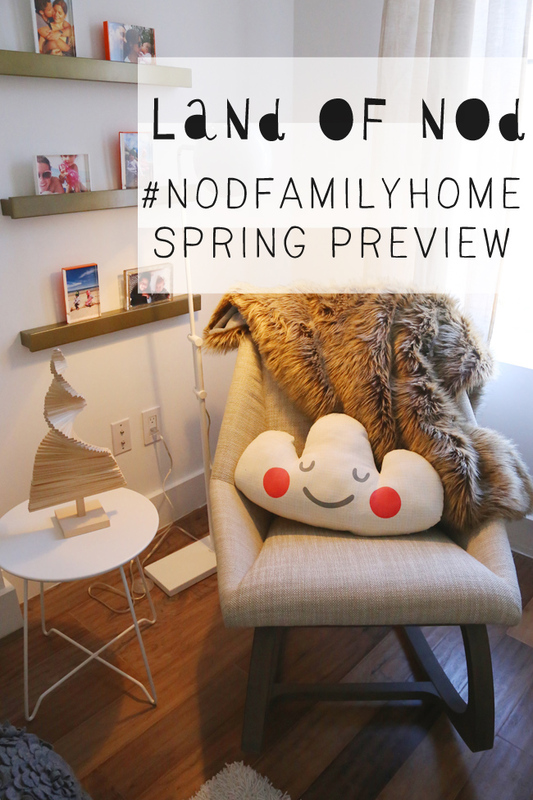 one of the land of nod hosts walked me through each room and pointed out details, quality of materials, and fun DIY projects throughout the space. they mentioned that this teepee design was by ashley goldberg, who i am a big fan of, and then they mentioned that she was on site. yay! 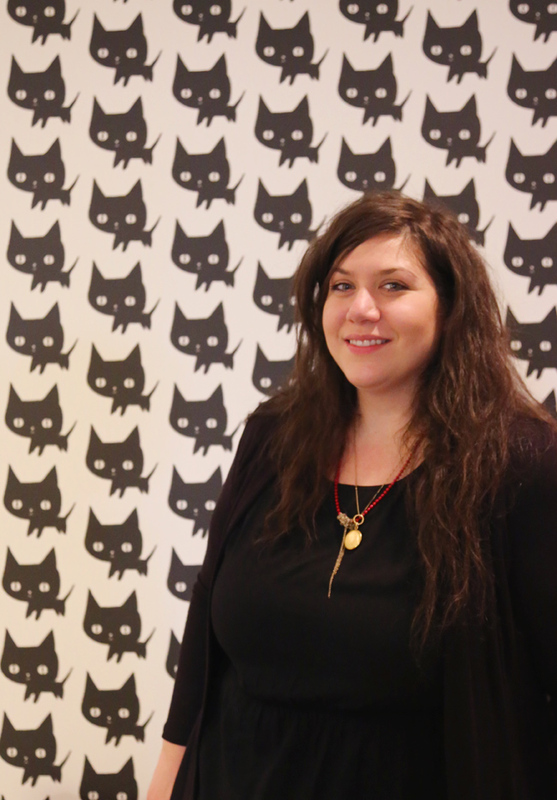 here's the lovely ashley in front of her awesome kitty wallpaper. we totally bonded over project life. so nice to meet you! next up were these adorable gingiber pillows and quilt. i loved, loved, loved this clever art installation by the nod team. 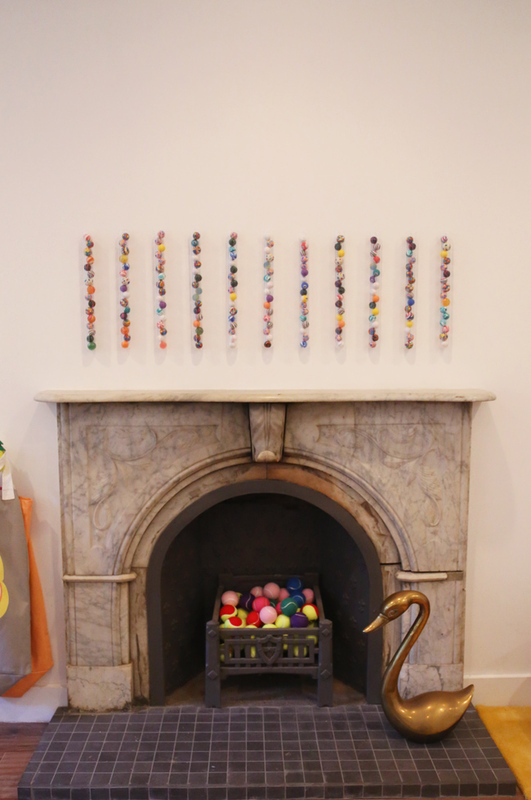 they used cb2 wall vases and filled them up with bouncy balls. SO CUTE. i love nod's designs and colors palettes, but the quality of their goods is just amazing. look at this incredible solar system quilt. 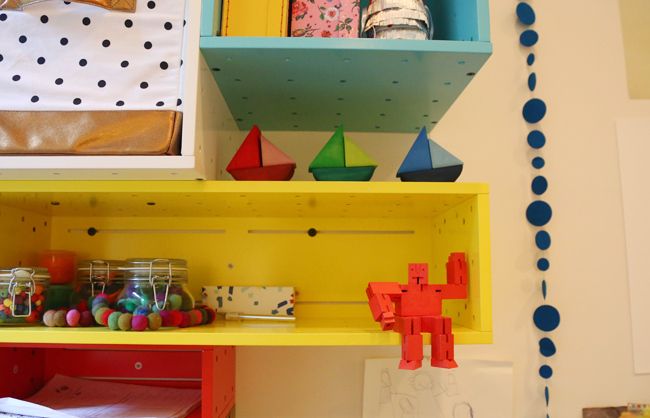 these colorful, modular shelves were very cool. love how versitle they are. and this dedicated craft area with a chalkboard table? yes, please. this guest room was so pretty. loved the softer pinks and mints mixed it. 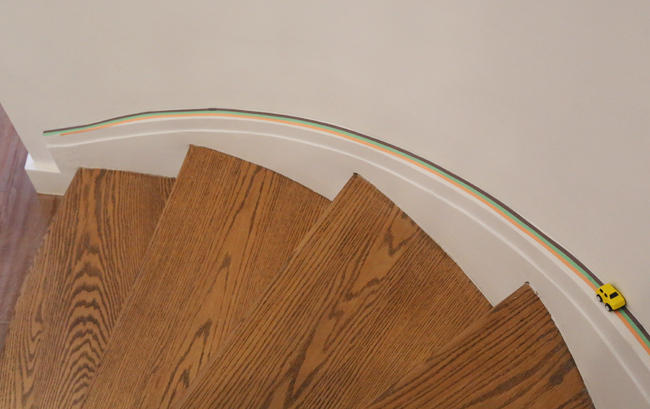 clever details, like this washi tape race track on the stairway baseboard, were abundant throughout the space. the master bedroom was so soothing and relaxing. 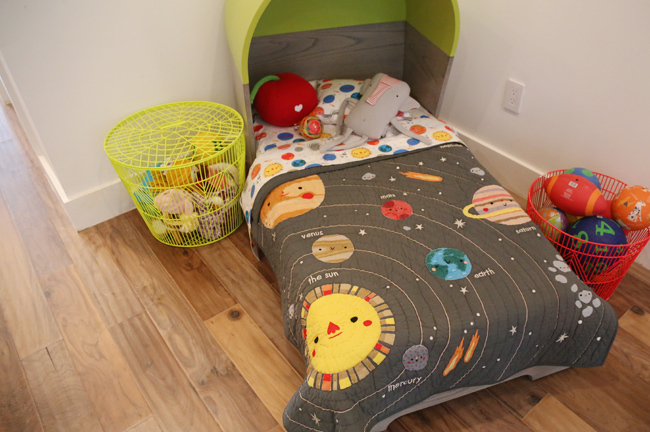 it was great to see how land of nod products aren't just for kids' rooms. this office space was brilliant. these wall-mounted desks were hung up at different levels to accomodate a teenager, a grade schooler, and a toddler. this chalkboard wall? DECALS. i didn't even notice the seams until they were pointed out to me. and those sheets? they are basically your 1980s notebook doodles brought to life. in hot pink. love the clock, too. and the amazing shiobiri curtains. this lofted bunk bed was smart, too. the desk and shelf pieces fit in to the slats, making it customizable for your space. and again with those amazing quilts. the top floor of this townhouse was amazing. so bright and airy! 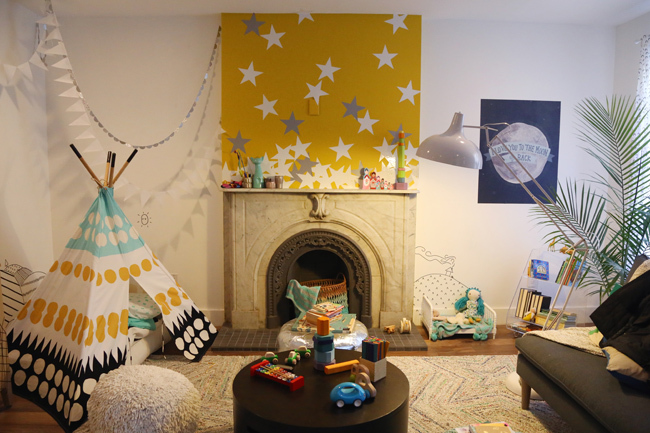 and to top it all off, it was decked out with goods from the new land of nod + golden book collection. that one doesn't come out until april (the products from the other floors debut in january), but it was fun to take a peek. and here is the lovely michelle kohanzo, who definitely has the best job in the world. so nice to meet you, michelle! like i said, i'm very likely moving to chicago in the near future, so if you need any more awesome people for your team, just say the word!